WATCH: Terry Crews, Jimmy Fallon "Nip Sync" on "The Tonight Show"
Crews also talked about his new book “Manhood” that deals with relationships and admitting to mistakes. Jimmy Fallon, Terry Crews "Nip Sync" on "The Tonight Show"
Fallon "Nip Syncs" with Crews on "Tonight"
Actor Terry Crews and Jimmy Fallon sang a shirtless duet of the Paul McCartney and Stevie Wonder song "Ebony and Ivory" on "The Tonight Show." First, Crews talked about his new book “Manhood” that deals with relationships and admitting to mistakes. Then, Fallon brought up the “Brooklyn Nine-Nine” star’s failed stint as a football player. “Firemen have to say don’t break down the door, because a lot of times the door is open,” Crews said. Fallon also brought up fellow “Saturday Night Live” alum Adam Sandler’s new movie “Blended,” in which Crews plays a “South African Tom Jones,” whose performances often include shirtless pec-bouncing. 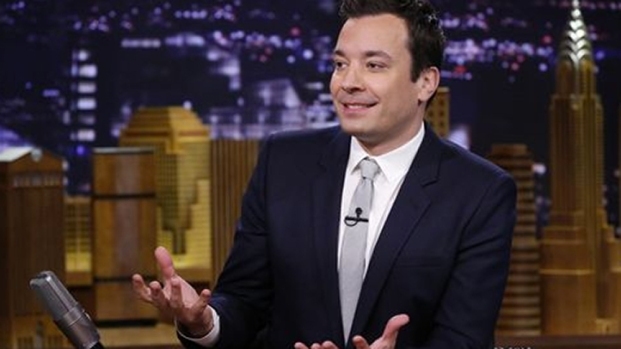 To prove he could match Crews' skill in the chest movement department, Fallon enlisted the actor to sing a soulful duet of “Ebony and Ivory.” Crews was shirtless while Fallon’s buff body was the work of a green screen.